The commercial spaceflight company Orbital Sciences has delayed the launch if its first delivery mission to the International Space Station next week by at least one or two days due to expected frigid temperatures. 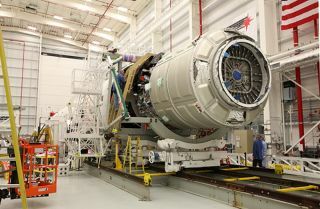 Orbital Sciences was slated to launch its unmanned Cygnus cargo ship and Antares rocket toward the space station on Tuesday (Jan. 7) from a pad at NASA's Wallops Flight Facility on Wallops Island, Va. But an extreme cold snap expected in the region early next week, along with rainy weather this weekend, led Orbital officials to delay the flight. The Antares rocket carrying Orbital Sciences' first cargo-carrying Cygnus spacecraft rolls to its launch pad at NASA's Wallops Flight Facility on Wallops Island, Va. ahead of launch. Liftoff is set for Jan. 7. Orbital Sciences initially hoped to launch the mission in mid-December, but delayed the flight to January to allow astronauts on the space station time to perform spacewalk repairs following a cooling system malfunction. Orbital Sciences has a $1.9 billion contract with NASA to fly eight cargo delivery missions to the International Space Station using its robotic Cygnus spacecraft and Antares rockets. The Dulles, Va.-based company launched its first Antares rocket last April, and the first Cygnus demonstration mission in September. The upcoming mission, dubbed CRS Orb-1, will mark Orbital Sciences' first official delivery flight for NASA under the contract. The Cygnus spacecraft for this flight is packed with 2,780 pounds (1,261 kilograms) of supplies and gear, a haul that includes 33 tiny cubesat satellites and 23 experiments designed by students. It should take Cygnus about three days to reach the station after launch, according to its mission profile. Orbital Sciences is one of two spaceflight companies with billion-dollar NASA contracts to keep the International Space Station stocked with supplies. The other company is Hawthorne, Calif.-based SpaceX, which has a $1.6 billion NASA deal for 12 delivery missions to the station using its Dragon space capsules and Falcon 9 rockets. SpaceX has already flown two of its 12 missions to the space station, and is expected to launch the third in February. With NASA's space shuttle fleet retired, the U.S. space agency relies on SpaceX, Orbital Sciences and its partners in Russia, Europe and Japan to fly cargo and crews to the station. The space agency also plans to use commercial U.S. spacecraft to fly astronauts to and from the station once those vehicles become available.